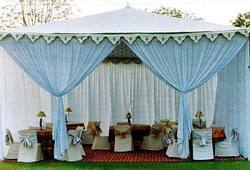 These exclusive Royal Arabian Tents are very. This is an eight sided - Octagon Tent, having a very Royal interior, specially designed for personal cocktail parties, romantic over night stays etc. Tent top : Outer is made of water-repellent Cotton Canvas, with lining of Velvet & Satin with hand embroidery on it. Color: Available in White, Pink, Red, Yellow, Golden, etc. We have various sizes and types in Arabian Tents. We have carved a niche amongst the most dominant names in this domain, engaged in offering Arabian Tent. Our company has achieved laurels in offering an exclusive range of Arabian Tent. 3. The PVC fabric is made from senior synthetic fiber and double PVC material. Have high strength, wind-proof, rain-proof, prevent bask in flame retardant, etc. In order to keep pace with never ending demands of clients, our company offers Arabian Tent. We offer a superior range of Arabian Tent to our clients, which is based on the historic concept of from arabia. These are designed using best grade raw materials and eye catching print. We offer our range in various sizes and designs, which can be customized as per the requirement of our clients. Furthermore, our range of tents is suitable for any occasion. White Arabian Tent, Size: 10/10 Or 20/1.